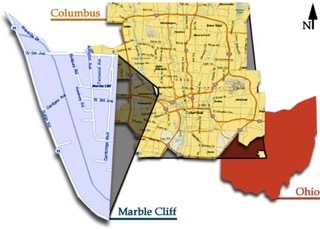 This year’s campaign against the gypsy moth has begun in central Ohio, including Marble Cliff . The Ohio Department of Agriculture said spraying to disrupt gypsy moth mating will cover nearly 75,000 acres in Franklin, Licking, Fairfield, Washington, Morgan, Athens, Perry, and Ross counties. Yellow crop-dusting planes will fly 100 to 200 feet above treetops and buildings spraying. Even Downtown Columbus is targeted. The droplets contain the pheromone that female gypsy moths use to attract mates. The overwhelming scent prevents male moths from finding the females. No mating means no offspring. The chemical, SPLAT GM-O, is organic and is not harmful to birds, plants, pets or humans, according to the agriculture department. “It was a mild winter, so egg mortality was probably less than what we had hoped,” said David Adkins, program manager with the state agriculture department. However, recent wet weather has helped the growth of a fungus that attacks the gypsy moth population, he said. Spraying began in earnest in 2000 to slow the spread of the moths westward across Ohio. Since then, the battle line has been pushed back east across the state an average of 52 miles, Adkins said. The proof comes from extensive trapping done every year to check the moth’s progress. The line has moved back and forth, he said, but has moved back eastward since 2009. The gypsy moth is a non-native, invasive species that feeds on the leaves of more than 300 different trees and shrubs. It especially is fond of oak. A healthy tree can usually withstand two years of defoliation before it is permanently damaged or dies. To date, 51 of Ohio’s 88 counties have established gypsy moth populations. The spraying program is part of the Slow-the-Spread effort involving 11 states. Updates on planned spraying are available at 614-387-0907 or 800-282-1955 Ext. 37 after 5 p.m.
Information about the gypsy moth, including maps of treatment areas, is available through the Ohio Department of Agriculture.